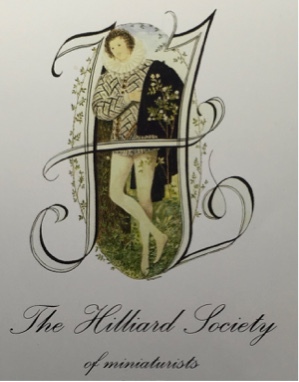 Last weekend we took a trip to Somerset where the Hilliard Society of Miniaturists was staging its annual exhibition. Held in Wells Town Hall it was good to meet old friends and fellow miniaturists for lunch there. While my young friend was parking the car (my hip was giving me a bit of trouble so I couldn't walk too far) I walked round the market square. An old friend of mine - Mary Rand - who won a gold medal at the Tokyo Olympic games in 1964, being a native of Wells, has been honoured with this brass plaque measuring the length of her acievement (Just over 22 feet) erected on one side of the square. 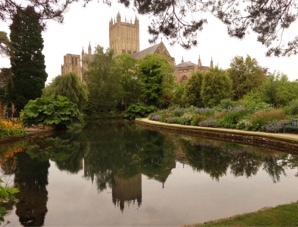 The Bishop's Palace Garden is a haven of tranquility set right in the middle of the bustling market town of Wells. This is the entrance to the Palace. 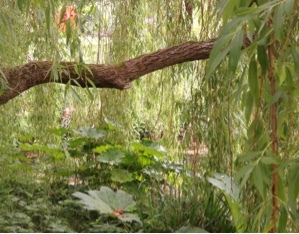 And here are some of the views inside the garden. 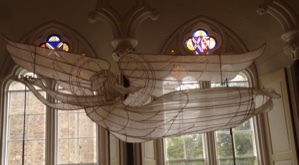 And inside we came across this large angel floating by a window. 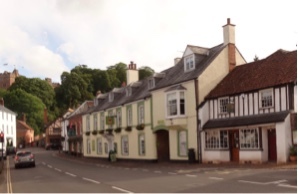 After touring the miniature exhibition and taking part in a council meeting in late afternoon we drove north to Dunster where we'd planned to stay at the Dunster Castle Hotel. 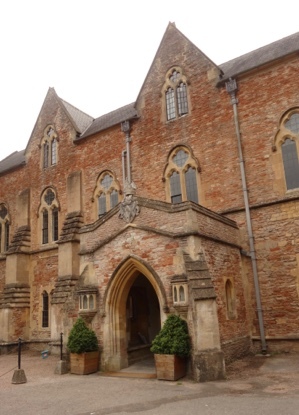 Perhaps you can see the entrance to the car park - it's between a narrow archway, but myf is a very good driver and manoevered our way through it with just inches to spare on either side. 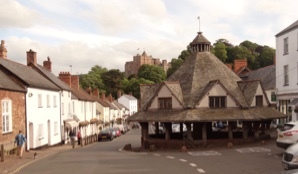 A few weeks ago when we were planning on where to spend a couple of days after the exhibition and decided on Dunster, I remembered that when I was a young apprentice artist in the late fifties I had designed a biscuit tin showing the Dunster yarn market building in the centre of the town. 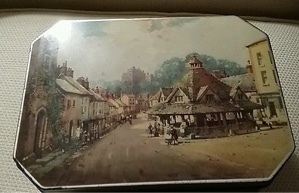 So after consulting Google we came across the actual tin (I'm afraid it's a bad reproduction) on ebay. I decided that when we arrived in Dunster I'd see what the view looked like today and probably make a new painting of the scene. Surprisingly it had hardly changed at all as this photograph taken on Saturday shows. Watch this space! I intend to start the painting soon. 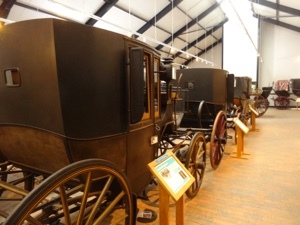 On Saturday we called in to Arlington Court - a National Trust country house which also houses the Carriage Museum. Home of the Chichester family for over 500 years, it's been 50 years since Sir Francis Chichester completed his famous round the world voyage. 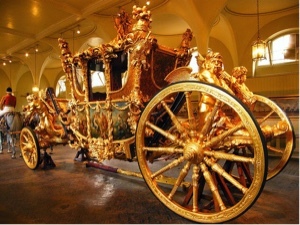 The Speaker's exquisite golden State coach is on loan to the museum but photography not allowed. 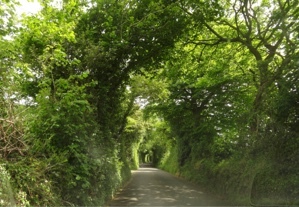 We travelled on through Exmoor - a really nice drive through a wide, undulating landscape. And arrived in Ilfracombe to be confronted by this enormous 25 tonne statue by Damien Hirst. 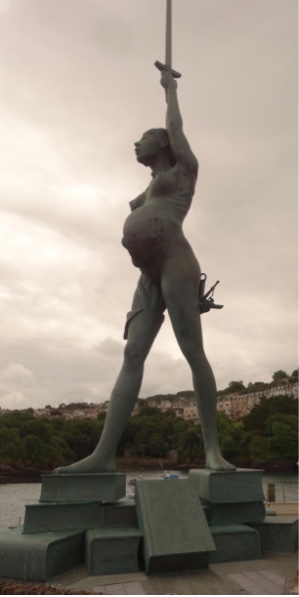 It's called Verity and is 66 feet tall and is an allegory for Truth and Justice. Her stance is taken from Edgar Degas's "Little Dancer of Fourteen Years". Fabricated in bronze, a 250 tonne crane was used to hoist the sculpture into its final position. 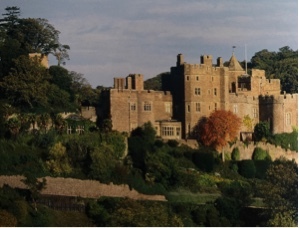 Dunster Castle has commanded its outstanding location atop the tor since the Middle Ages. 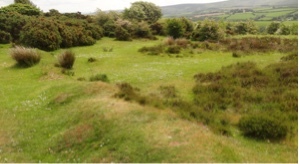 Originally built and fortified with defence in mind, it has changed greatly over the years and leaves a story of the people who have lived there. Although it looks impregnable, Oliver Cromwell ordered its destruction during the Civil War in 1650, but finally allowed the Luttrall family who lived there to retain their castle home. 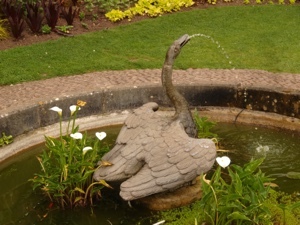 Sir Walter Luttrall gave it to the National Trust in 1976. 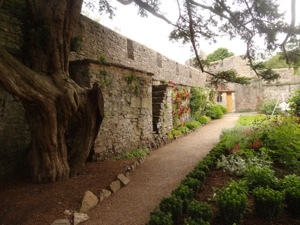 This is the entrance to the castle. Luckily there was a very nice man operating a buggy up to the castle as there was no way I could have made it with my atrhritic hip. My young friend took the energetic way up. I took the opportunity before going into the castle to practise a little archery on the lawn outside, being a lapsed toxopholite. (In my younger days I became a member of an archery club and even constructed a machine to make arrows of exactly the same weight). My favourite room in the castle was undoubtedly the Leather Gallery. 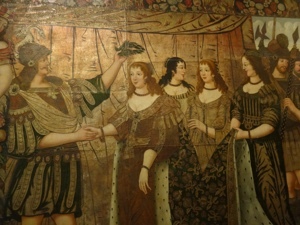 The large painted leather hangings are the only collection of this type in the country. 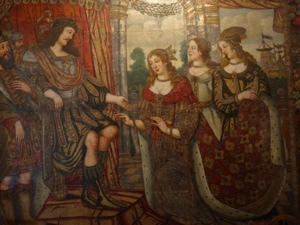 They tell the love story of a Roman General, Antony, and an Egyptian Queen, Cleopatra, a tale made famous by Shakespeare. 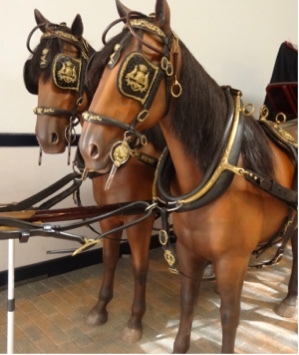 Made of calfskin, the hangings are embossed and painted to give a three-dimensional appearance. 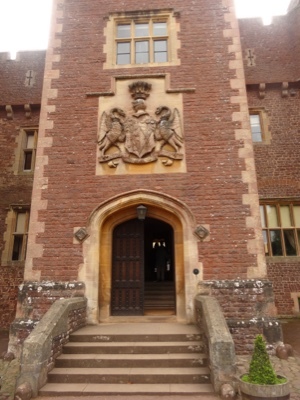 The hangings were probably made in the Netherlands in the late 1600s and first hung in Dunster Castle between 1701 and 1741. 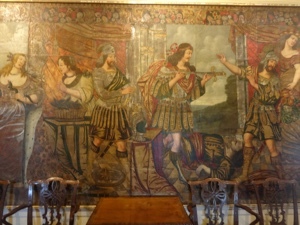 Leather hangings were often chosen for dining rooms as, unlike fabric, leather does not retain food smells. 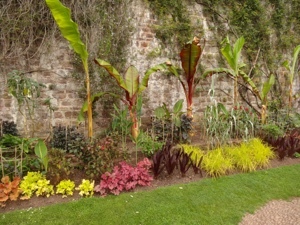 In the garden we came across this wall of banana trees and a stone swan spurting water. Driving home through leafy tunnels it had been a very nice weekend. Just ordered a couple of stretched canvases for an oil portrait and the Dunster painting. I'm trying an extremely fine Polyester primed canvas as I want to achieve extra detail.